In the past I sued Sohu for deleting my blog posts, but now I want to praise them. Sohu is the only BSP that posts notices on my blog saying, “this post has been hidden/removed for certain reasons . ” As a result, when web users visit my Sohu blog, they can know that a post has been hidden by Sohu. I think Sohu is brave to do this. I also run blogs on Sina, Ifeng, and others, but they simply delete blog posts without notifying my readers. Last year I met Liu around the time he was trying to sue Sohu for deleting some of his blog posts. He argued that the censored posts, analyzing criminal court cases, did not contain material that violated Chinese law, and that Sohu was therefore violating his user agreement. The lawsuit didn't get very far. Liu told me at the time that he writes on a dozen or so different blog hosting services because they all seem to have different censorship criteria - so for Chinese bloggers maintaining multiple blogs is the best way to keep your writing alive on the web. My conversation with Liu inspired a systematic study of how blog-hosting companies serving mainland China censor their users' content. All Chinese blog-hosting companies are required by government regulators to censor their users' content in order to keep their business licenses. But as Liu discovered, they all make different choices not only about how to implement censorship requirements, but also how to treat the users who get censored. Most Chinese bloggers who want an audience inside mainland China use domestic Chinese blog-hosting services - only a very tiny minority use overseas services like Blogger or Wordpress.com because they tend to be blocked, and even fewer have the tech skills to do their own custom Wordpress installation on their own rented server space. The aim of my research was to look at the Chinese blog-hosting services (which includes foreign brands offering services inside China to the Chinese market) and establish how much variation there is in terms of what gets censored and how it gets censored. Since it's not in the interest of people who work at blog-hosting companies to tell the truth about these things in great detail to a foreign researcher, I decided that the best way to do this would be to post a range of content across a number of blog-hosting services and track who censored what and how. With the help of John Kennedy, Ben Cheng, and some student research assistants, my team posted more than 100 pieces of content - passages from news items, blogs, and chatrooms of varying political sensitivity - consistently across 15 different Chinese blog-hosting platforms. We found that censorship levels and methods vary tremendously from company to company. I have written about some of the interesting findings that came up as we went along here, here, and here. 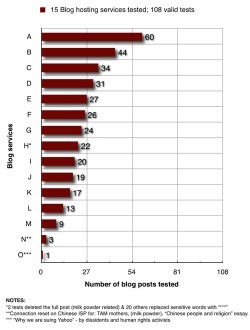 UPDATE: In reaction to numerous queries I'm willing to disclose the list of blog hosts tested, but I will not say here on a public blog which ones correspond to the letters on the chart. The blog hosts are, in alphabetical order: Baidu, Blogbus, BlogCN, iFeng, Mop, MSN Live, MySpace, Netease, QZone, Sina, Sohu, Tianya, Tom, Yahoo! China, YCool. Below are updated slides from presentation I gave at a recent conference discussing the details of my research results. A number of the slides illustrate the ways in which blog hosts not only censor different amounts of content, but examples of different censorship practices, with wide variation not only from service to service, but also depending on the nature of the content. I am writing an academic paper about this research which - given the slow gears of academic journal publishing - will probably take a year or more to get published. Given how quickly things change, however, it's useful to many people for me to share my findings and solicit feedback now. Please post your feedback in the comments section at the bottom of this post, or send me thoughts by e-mail (see my "about" page). Internet ﬁltering (“the great ﬁrewall”) is only one part of Chinese Internet censorship. Domestic web censorship is not centralized at all. Domestic web censorship is outsourced by government to the private sector. Domestic web censorship is inconsistent - if you can't post successfully in one place, itʼs usually possible to post your content somewhere else, at least for at least a while. The system of “managing” user-generated web content in China appears to follow a similar logic and approach as the system for controlling professional news media. When I write my paper those will be elaborated upon. I also identified a number of implications for researching Chinese censorship "inside the great firewall:"
Unlike automated ﬁltering tests, these tests require manual testing and constant analysis by Chinese speakers with contextual knowledge - it is tedious work requiring attention to detail. Need surveys of web service company employees. Need surveys of users and bloggers about their experiences. Circumvention is important but itʼs not the solution to the whole censorship problem. Need to do more to foster a global “user rights” movement demanding greater transparency and accountability by Internet companies on privacy and free expression. The Global Network Initiative is a good start in this regard but we need much more. Will the “Chinese model” - in which governments demand censorship by web companies - spread globally? What issues in this vein should the advocacy community be preparing for? What further research needs to be done to better understand global trends? Got any views or anything to add about any of the above? Please hit the comments section. UPDATE (Dec.1st): The good folks at YeeYan have translated this blog post into Chinese, here. 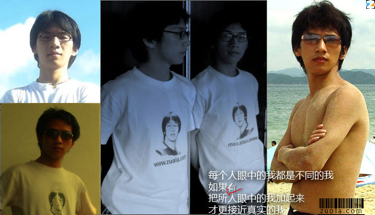 Blogger Zhou Shuguang a.k.a. "Zola" barred from leaving China: "potential threat to state security"
27 year-old blogger Zhou Shuguang goes by the nom-de-blog "Zola." The tagline of his blog says in English: "You never know what you can do till you try." He seems to be hitting up against the limits of what the Chinese authorities will let him do. It's unclear exactly what caused Zola to be deemed "a potential threat to state security," but he has been known to push the limits. Last Fall he was detained in Shenyang, roughed up a little, and sent home to Changsha when he tried to investigate protests related to a bizarre pyramid scheme. In June he announced he was going to Beijing to blog the Olympics. Soon thereafter, the police paid him a visit and told him it would be in his interest to stay home in Changsha. Once the Olympics were over he headed back to Beijing where, among other things, he worked with other bloggers to investigate the illegal "black jails." I just communicated with Zola online. I asked him how he's feeling - he said he's tired but he feels ok, isn't stressed. I expressed surprise. He replied: 还好吧，我反正是玩，没什么压力. Which basically means: "It's ok, I'm just having fun, there's no pressure." I asked him if he has any theories why he has been prevented from leaving the country. He said he's not sure what exactly he did that caused him to be labeled "a potential threat to state security." But he did speculate that the police might be "gathering evidence." What kind of evidence? "Maybe similar evidence as they got from Hu Jia," he answered. Given what happened to Hu Jia, it's amazing he is not stressed. For more on Zola see Global Voices here, here, here, and more generally here. See the Wall Street Journal here. Blog posts I've written about him or mentioning him are here here and here. Zola gives a timeline of events. Global Voices Online: China: Citizen reporter Zuola becomes a potential threat to state security?! Beijing-based lawyer Liu Xiaoyuan has some legal advice for Zola here. We've got to do this!! For my many globally-minded readers, note that global experts will be live-blogging the election from around the world. See Voices Without Votes for details.